Located on the banks of the mighty Goulburn River, approximately 90 minutes from Melbourne, Mitchelton is the ideal location for a winery wedding. The Glen Hotel provides beautiful event spaces for your wedding with The Marquee overlooking beautiful gardens and The Elaine Room with its classic elegance. Southport Yacht Club, the Gold Coast’s premier Sports Club offering a magical wedding venue overlooking our 300 Berth Marina. Fix Restaurant at the Port Hotel offers a boutique venue that can be styled in any theme for your wedding day. Our superb staff are on hand to help manage every aspect and make your big day unforgettable. The Epping Club's sophisticated 5-star facilities make for an unforgettable wedding celebration. Bells at Killcare is a secluded coastal retreat, perfect for stylish boutique weddings. The Royal Automobile Club of Australia is the perfect venue for your wedding reception. Vows with a view, hospitality with vision. An unforgettable location for you to create your first memory as husband and wife. Dunbar House is a historic mansion built in the 1830's located just 30 metres from Sydney Harbour in Robertson Park. Offering a range of venues and services in the heart of Canberra, The National Gallery of Australia is a unique and creative alternative for your next event. Flaxton Gardens promises you a warm welcome and all that you would expect from an award-winning establishment. The Bathers’ Pavilion is an historic building sensitively renovated to modern comfort and is perfect for your wedding day celebrations. A sandstone castle set on 3 acres of beautifully manicured gardens make Curzon Hall a truly elegant Sydney venue. Cruise Sydney Harbour on your wedding day for style, adventure and complete privacy for you and your guests. The Playford, a member of the MGallery Collection, is a boutique multi award-winning hotel in the heart of Adelaide. From our elegant ambiance to our spacious ballrooms layered with exquisite detail, The HIGHLINE Venue is an idyllic destination for all engagement parties, wedding ceremonies and receptions. Encore has a backdrop of shimmering water, swaying palms, sailboats and kite surfers silhouetted against the glinting sunset over Port Phillip Bay. Nestled above the turquoise waters of the Indian Ocean, The Ungasan Clifftop Resort is the ultimate location for a tropical and beautiful Balinese wedding. Unparalleled paradise awaits guests visiting the Fiji Marriott Resort Momi Bay. Located in Nadi, Fiji and perched on the blue waters of Momi Bay, our five-star resort is the ultimate island retreat. Sheraton Melbourne Hotel creates an unforgettable wedding ceremony or reception at one of the best hotels in Melbourne. ZINC makes each wedding a unique and wonderful celebration that will be remembered forever. The multi award winning Waterside Event room is ideally positioned to showcase picturesque waterfront views along Currumbin Estuary. The Deck at Circa boasts a light-filled gallery-esque space, with floor-to-ceiling windows, and iconic timber panelling. With a stellar reputation and the honour of hosting thousands of unique weddings in Sydney at our venues, rest assured that you are in the hands of the best. Discover a place where elegance meets revelry and intimate moments mingle with shared celebration. With uninterrupted views from Lavender Bay to Circular Quay, beautifully restored heritage buildings and elegant venues, Luna Park Weddings combines the beauty of old world charm with the sophistication of modern romance to bring the most personal of celebrations to life. A Sydney beach wedding venue and ceremony that will add a whole new dimension to your wonderful celebration. The Metro Mirage Hotel, Newport is a multi-award winning 4-star waterfront hotel and stunning outdoor ceremony, wedding reception and function venue. Set within the magnificent Strand Arcade in the heart of Sydney’s CBD, La Rosa The Strand is a stylish and unique venue for your wedding. Novotel Newcastle Beach is the perfect venue to celebrate a marriage or any special occasion. Earthy and elegant, Lure is the Whitsunday’s newest venue, located waterfront in the heart of Abell Point Marina. Set amongst perfect gardens and courtyards, The Hills Lodge is the ideal venue for both your wedding reception and ceremony. Surround by rustic bushland and rolling hills, Foothills Conference Centre in the picturesque Yarra Valley Ranges, is the idyllic location for your wedding. The Palm House at BIG4 Adventure Whitsunday Resort elevates the style and magic of Whitsunday weddings and receptions for up to 200 guests. Ideally located on Drummoyne's waterfront, Café Birkenhead's new venue provides the perfect setting to celebrate your wedding reception with stunning water views. Situated in the heart of Hunter Valley Wine Country and surrounded by beautifully landscaped gardens, the Mercure Resort Hunter Valley Gardens is a beautiful setting for your wedding. The Australian Museum is a truly unique and historic venue offering a wide range of spaces for weddings that your guests will never forget. Palm Beach Golf Club overlooks Pittwater and out to Lion Island, with expansive views of the picturesque golf course. It is the perfect setting for a beachside wedding. At Bimbadgen, we love the challenge of making every little detail of your wedding count so it will run seamlessly and effortlessly towards a perfect... ‘Beginning’. City Beach Function Centre is ideally located on the water's edge of Wollongong's City Beach with the iconic lighthouse, golden sands and rolling surf forming the perfect backdrop. This waterfront venue with stylish function rooms and magnificent harbour views offers chic but relaxed ambience. Zest, The Spit is a new, absolute waterfront venue opening in early 2011. Celebrate in style at The Tea Room QVB. Doltone House Sylvania Waters is built around the picturesque Gwawley Bay in South Sydney’s Sutherland Shire and is charmed by its elegant ambience. Your forever story begins here. A romantic and private retreat for in love couples with a stylish, relaxed atmosphere and bountiful natural light. Doltone House Jones Bay Wharf is a unique heritage venue situated on a restored finger wharf on the foreshore of Sydney Harbour’s Pyrmont. A spectacular decking area offering outstanding views of the Harbour Bridge. The newest green waterfront venue providing couples with an environmentally conscious venue alternative with the same style and sophistication of the Doltone House brand. Beautiful, unique and romantic, Lauriston House is the perfect venue for your wedding. Conca D'oro is the pioneer venue of the reputable brand Navarra Venues. It has produced a wealth of events and boasts award winning service. Linton Gardens is a multi-award winning Reception & Function Centre (Restaurant & Catering Association of New South Wales). Be captivated by this intimate setting, breathtaking harbour views, impeccable service and exceptional food and wine. Overlooking the sparkling waters of Iron Cove Bay stands the exquisite Le Montage; a contemporary event space that sets the benchmark in luxury weddings. Banjo Paterson Cottage Restaurant is a charming heritage sandstone cottage dating back to the 1830s. Situated in the most spectacular and prominent coastal location in Sydney, this is the perfect setting for your ceremony and reception. Located on the shores of Lake Macquarie, Bay Views Weddings and Functions offers beautiful lake views, stunning sunsets and sensational food. This sparkling waterfront location with elegant and glamorous intricacies of design, and luxury space with absolute privacy, will leave you captivated. Newcastle City Hall's affordable style, elegance and grandeur provides the perfect backdrop to celebrate your special day. Surrounded by the Pacific Coast, the Tasman Room is the ultimate, affordable option for your wedding day. Raffertys offer the perfect backdrop for exchanging your wedding vows. A special day deserves an exceptional place.... Restaurant Cuvee at Peterson House is the perfect venue for Garden weddings and wedding receptions. Where detail is everything, Mandavilla Event Centre is famous for weddings and receptions from the most lavish affair to a private intimate occasion. The UNESCO World Heritage-listed Hyde Park Barracks Museum is an impressive landmark on historic Macquarie Street, and a breathtaking venue for hosting a magnificent city wedding. Elizabeth Bay house is a magnificent example of colonial architecture with sweeping views of Sydney Harbour. Bankstown Sports Conference and Event Centre's promise is to give friendly help in organising your wedding, from day one, to the last dance! With its wide sandstone verandahs, historic interiors and glorious 1830s garden, Elizabeth Farm provides a marvellous setting for both weddings and business events. The Mint is a multi-award-winning venue containing innovative and stylish contemporary event spaces. or the very best in Weddings, Functions and Conferences, you can select from a wide variety of packages to meet your needs in the Renaissance Centre at Wallsend Diggers. Amaze your guests at this stunning waterfront venue. As with everything associated with their estate, the team at Margan Family Wines wants your celebration to be a stylish yet relaxed affair. Situated on one of Sydney's stunning harbour beaches, Club Rose Bay is the perfect location for an intimate celebration with friends and family or the most elaborate wedding. Nestled on the shores of the stunning Brisbane Waters, The Boathouse Waterfront Restaurant sits literally over the water. There is nothing more enchanting than a romantic wedding on the island of the Gods. Celebrate your wedding in a uniquely Balinese way for a lifetime of memories. Set in the natural beauty of the Sutherland Shire, Tradies Events Centre is renowned for its award winning service, outstanding cuisine and attention to every detail. InterContinental Sydney's rich heritage and spectacular location makes it the perfect venue for both your ceremony and reception. Established 85 years ago by a group of ex-Servicemen, Cabra-Vale Diggers prides itself on friendly customer service, eight bars, outdoor terraces and regular live entertainment. Roseville Golf Club is one of Sydney's premier golf and function venues. Located on the harbour's edge, Manly 16ft Skiff Sailing Club is one of Sydney's finest wedding venues. Day or night the view is breathtaking and the space is stylish and elegant. Cypress Lakes is nestled within the backdrop of the Brokenback Ranges across 320 acres of mature bushland and gardens. Imagine cruising up the Yarra and arriving in style at Amora Riverwalk Hotel. Say "I Do" in the gardens then relax with guests afterwards in the stunning fairy lit marquee. Set in the cultural hinterlands of Bali, make your dreams come true overlooking the rice paddies and river of Maya Ubud Resort & Spa. Beautiful and exclusive marquee settings provide the most elegant and chic atmosphere for your wedding. Doltone House Hyde Park offers contemporary sophistication directly opposite Sydney’s Hyde Park, with floor to ceiling arched windows. Surfers Paradise Marriott Resort & Spa... The perfect backdrop to your perfect wedding day. Perched high above Whale Beach, Jonah's is the ultimate beachside location for your wedding. With versatile and stunning outdoor or indoor settings, the award-winning Eden Gardens can make the perfect wedding location. Hunter Valley Gardens is a unique wedding venue, offering couples a world of options to create your perfect wedding day. Deckhouse is located on the water's edge at the historic Woolwich Dock, and provides panoramic views of Sydney Harbour and city skyline as well as a unique perspective of one of Australia's oldest working boatyards. An intimate event space with adjoining terrace, Dedes on the Wharf is ideal for any special occasion. Situated at Pyrmont's Jones Bay Wharf, boasting a number of coveted awards and rustic interior celebrating the site's industrial-maritime heritage, Flying Fish serves up spectacular views and outstanding events. Nestled next to Abbotsford wharf, Dedes enjoys panoramic views of the harbour and is a short ferry ride to the city and to Parramatta. Orso Bayside Reception is the absolute Waterfront Function Centre. Superbly positioned on Sydney's Middle Harbour, adjacent to the Spit Bridge in Mosman. The elegant and fully licensed Vaucluse House Tearooms offers a classic setting for a traditional high tea. With stained-glass windows, looking onto the beautiful grounds. Caves Beachside is a multi award-winning venue and a luxury water front development which is nestled between the ocean and Lake Macquarie. Lindesay is a much"sought after venue by brides, being an elegant 1830s mansion with full views across manicured lawns to Sydney harbour. Exceptional service, versatile spaces and flexible catering options are complemented by an iconic Harbour backdrop. Nestled amongst the rolling hills of Mount View, Briar Ridge offers one of the most picturesque winery settings in the Hunter Valley. Beautifully timeless and "exceptional in every sense," Stamford Plaza Sydney Airport is the perfect venue for your Sydney wedding. The Royal Motor Yacht Club at Newport provides a spectacular setting for your wedding ceremony and wedding reception. The International of Brighton provides a dramatic and opulent venue for any celebration. Sydney Living Museums has seven historic wedding venues for hosting ceremonies, receptions and photography. Double Bay is a destination with a distinct style, modern twists and timeless classics, creating a uniquely glamorous affair. Dockside Group has a collection of iconic waterfront venues perfectly suited for your ideal wedding day. Botanica Weddings is the Perfect Marriage of exotic Bali, with the efficiency of Australia’s top wedding team. Glen Erin at Lancefield is the ultimate 4 ½ star luxury with country hospitality that specialises in tailoring Weddings and Functions to your individual requirements. Bonville Golf Resort is the leading wedding ceremony & reception venue in Coffs Harbour and the greater North Coast offering the complete wedding experience. 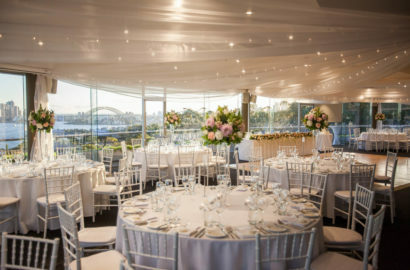 River's Edge Events is the only wedding venue in Melbourne CBD that boasts 180 degree views all year round, sun light from spring to early autumn and sunset panorama along the Yarra during the long summer evenings. Set in the heart of the Sydney CBD, a wedding celebration at Sofitel Sydney Wentworth is a truly unforgettable experience. Capturing romantic sunrises, the warm summer sun throughout the day, and ultimate sunsets, the Beachside Dojo can play host to an exceptional and memorable event that is sure to impress your guests. Gledswood Homestead & Winery is an historic homestead & wedding venue offering both garden ceremonies and wedding receptions. The Samaya Seminyak is for couples that are looking for a truly fresh and inspiring style to celebrate bonding together in marriage. Set off in style as you escape to the romance & excitement of Melbourne's waterways upon the luxurious MV Pearl Super Yacht. Quat Quatta is an exceptional boutique venue, providing a magical setting for any event. RACV Club is the perfect place to celebrate with family and friends in the heart of Melbourne. A timeless ballroom from the classic Victorian era with Corinthian wall pilasters, stain glass windows and brass & etched glass gasoliers available for weddings. Sophistication. Style. Glamour. The ultimate in luxury Sydney city weddings. Set within the historic Werribee Park Mansion only 30 minutes from Melbourne, ‘The Refectory’ is nestled in 10 acres of formal gardens and rolling lawns surrounding the grand 1870s Mansion available for weddings. With its understated oceanic setting, Moby Dicks on Sydney's Northern Beaches offers a bright and open space, the perfect setting for any traditional or relaxed event. Lakelands Golf Club is the ultimate one stop wedding venue, voted the number one golf course wedding venue on the Gold Coast! A grand, Palladian-inspired mansion, Mansion Hotel and Spa is set on 10 acres of rolling parklands. Only a one hour drive from Melbourne, Spring Hill Estate by Lancemore is nestled in the magnificent Macedon Ranges and has an unmistakable Australian feel to it. Set on 8 acres of beautiful gardens and vineyards, with picturesque views out to Mount Buffalo, Lindenwarrah is the premier wedding venue of North East Victoria. Lindenderry at Red Hill offers the most memorable of settings for your big day. By the pristine white sands of arguably the world’s most beautiful port, give your guests an event they’ll cherish for years to come at Anchorage. Its superb setting in the picturesque Hunter Valley, great venues, quality catering and savvy staff make Estate Tuscany one of the most sought after country venues. From a suspended Earthball to the exposed brick of the theatrette, Newcastle Museum offers four breathtaking spaces for you to host a truly unique wedding. Newcastle’s premier beachfront reception venue offering four elegantly appointed function rooms with spectacular views overlooking Newcastle Beach or Newcastle Harbour. Surrounded by beautifully-landscaped grounds, gardens and natural water courses, The Greenhouse is a truly romantic venue for your wedding. With glimpses of Sydney Harbour through the luscious garden surrounds, Botanic Gardens Restaurant is one of Sydney’s best kept secrets. Centennial Homestead is surrounded by rolling green lawns and sun drenched spaces. Complete your modern day romance by hosting your wedding ceremony within the simple style of STUDIO Sydney Tower. The Calyx is designed to be a living art gallery and a theatrical experience, housing moving botanic exhibitions that heighten all your senses. Enjoy views of the Three Sisters and the Valley while celebrating a memorable milestone. The Pavilion makes a striking impression and provides the perfect backdrop for an unforgettable day. Walsh Bay Kitchen is a world class restaurant boasting an outstanding harbourside location. Orchestrate your Wedding at Hotel Tugu Bali, where timeless romance and exotic luxuries blend. Waldara is the perfect setting for intimate sunset weddings, chic cocktail events, or enchanted banquets under the clear night sky. Dungula is a blank canvas where your dream wedding can become reality…. Lake House is a tranquil retreat for your reception with magnificent views and award winning cuisine. Views of the Melbourne city skyline, complemented by a dramatic feature bar and stylish designer interiors, this New York loft style venue is sure to impress. Albion Farm Gardens is a family owned and operated business full of passionate garden lovers. Chinoiserie B&B is a country cottage in 'Storybook' style with extensive flower gardens. The award winning Coral Sea Resort, in the exclusive sea side enclave of Airlie Beach is an oasis of luxury and tranquillity offering exclusive Whitsunday wedding packages. Located in the picturesque Southern Highlands, the Mittagong RSL is the ideal place for your wedding ceremony and reception. Montsalvat is Australia’s oldest artists’ community, set amid unique grounds and buildings. Plan a unique Hunter Valley Wedding at Mulla Villa in historic Wollombi. Tucked away in idyllic aquamarine waters of the Great Barrier Reef, Palm Bay is perfect for a destination wedding. Redleaf is the most beautiful setting for you to create your own special day. You have access to the entire property. Set on the banks of Lake Connewarre, Campbell Point House is an estate of exquisite refinement and unparalleled beauty. The Mineral Springs Hotel offers a destination wedding venue with a difference. Set your wedding beside Brisbane River at WATT, where an industrial chic setting allows you to host your dream wedding of relaxed elegance. This impressive country plantation-style 7-bedroom Villa Puri Nirwana is located in one of the most tranquil areas of Bali where just outside its doors; the beauty of local culture still remains. It’s easy to envision the intimate wedding of your dreams at the exquisite Grand Cliff-Front Residence. A glamorously modern 5-bedroom private villa sitting atop the stunning limestone cliff. From the intimate to the lavish, traditional to the contemporary, The Langham, Melbourne is dedicated to ensuring your wedding is perfect and uniquely yours. Situated in the heart of the Hunter Valley, Club Maitland City is only 20 minutes from the wineries and 2.5 hours from central Sydney. The club prides themselves in sports, service and accommodation will ensure your visit at the club is one to remember. Hunters Quarter welcomes you to its table, to join in the warmth and generosity of its international cuisine. Murray's Brewery offer beautiful, casual weddings amongst the grape and hop vines. Unique and picturesque locations for wedding ceremonies onsite at a 35 acre property. Tocal Homestead & Function Centre is a premium venue for wedding receptions in the Hunter Valley. Enzo was est. in 1996 and is a successful award-winning restaurant, family owned operated and proud of it! Pinnacles is the ultimate in luxury self-contained accommodation situated in Airlie Beach, the gateway to the Great Barrier Reef & the fabulous Whitsunday Islands. The Entertainment Grounds is the perfect venue for your next function or event, with a variety of flexible venues and spaces which can be tailored to suit your every need. AQWA - The Aquarium of Western Australia is one of the most unique and memorable wedding venues in Western Australia. NSW South Coast hotel offering Kiama accommodation only 90 minutes from Sydney. Evanslea Luxury Boutique Accommodation is a little slice of paradise in the heart of Mudgee, offering you an elegant and stylish backdrop for one of the most precious days in your life. Located within the highly sought after Albert Park Lake, The Park is celebrated for its tranquil views, extravagant chandeliers, open and stylish warehouse interiors and dramatic arched windows. Located on 90-hectares of cliff-top land perched above Jimbaran Bay, AYANA Resort and Spa, BALI offer a truly romantic destination wedding experience surrounded with unmatched sunset views of the Indian Ocean. High on Observatory Hill in the historic Rocks district, Sydney Observatory is housed in a beautiful heritage-listed sandstone building. Rouse Hill's House and Farm has a rich historical significance which adds atmosphere to every event. The expansive grounds at Rouse Hill offer a real ‘step back in time’ and provide a charming and historic setting for cocktail parties, lunches or dinners under a marquee. All elements of your Hunter Valley wedding at Kirkton Park Hotel have been thoughtfully included in our wedding ceremony and reception packages. Steamers Bar and Grill is situated in Wollongong, which holds one of the most stunning views of City Beach and Wollongong lighthouse. Ovolo Inchcolm definitely specialise in you-nique weddings. The venue offers high-end, modular event spaces that caters for all occasions, especially for couples who are looking for the perfect venue for their big day. With it’s beautiful natural surrounds manicured centuries-old gardens and different habitats each designed to reflect the native homes of animal communities, the Melbourne Zoo and Werribee Open Range Zoo provides a magnificent setting for truly memorable weddings. Boasting incomparable views of Sydney Harbour, the Opera House and a sparkling city skyline – the Museum of Contemporary Art is the perfect place for your perfect day.